Tick, tick, tick, it is getting closer and of course I am super excited. My cards have been sent, the baking has been started, decorating is completed, which not only is a great start to the season but will take the pressure off later. 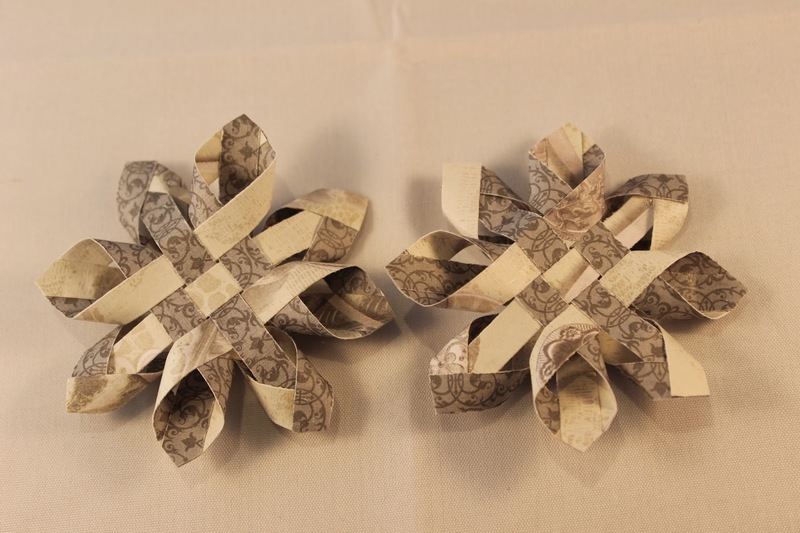 Today's project was a quilt guild evening where we all learned how to make these wonderful 3D snowflakes, it is all in how you assemble them that brings in the 3D aspect. The original pattern is for the larger 6" flakes, as usual I can't leave anything alone I must make some changes. With that in mind I adapted the pattern by cutting it in half whie creating a much smaller 3" version. These small snow flakes turned out adorable, so I figured why not try making them out of double sided paper instead of fabric, actually they turned out quite well. Although I still think the fabric ones have a bit more appeal to them, I guess it depends on where they will be used. One of our family favourites is the handmade Christmas Crackers that line the table for our evening meal. 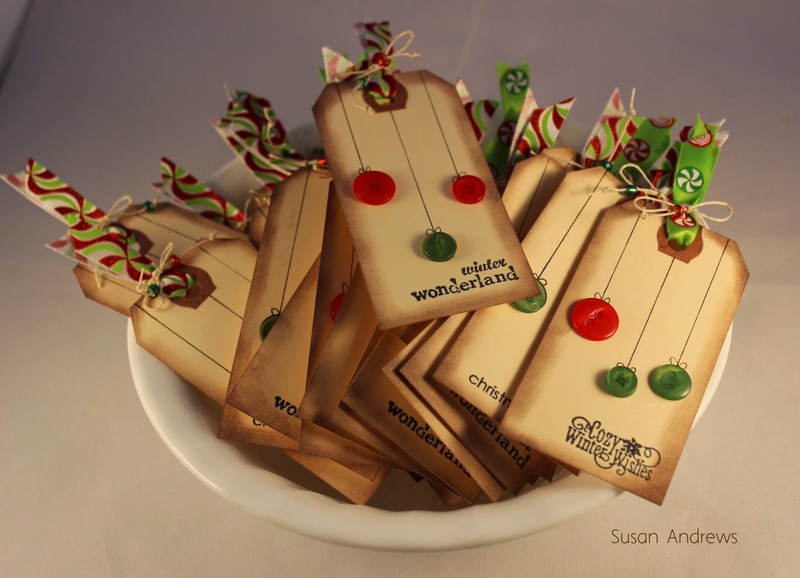 These crackers are filled with wonderful tasty chocolates plus a little something in the form of a gift. The only problem with the traditional cracker is I no longer eat sugar and I really have no desire to feed it to my family. With that being said the impitous for this years cracker replacement has come from the second issue of the amazing magazine Willow and Sage by Stampigton Company. This magazine is full of wonderful bath and body products including recipies, packaging and lots of gift ideas. While perusing through this great mag I came across this sweet but not so tasty peppermint candy inspired soap packaging, which not only gave me the idea of a new cracker idea but fell into place with the soap making that my daughter and I have gotten into. 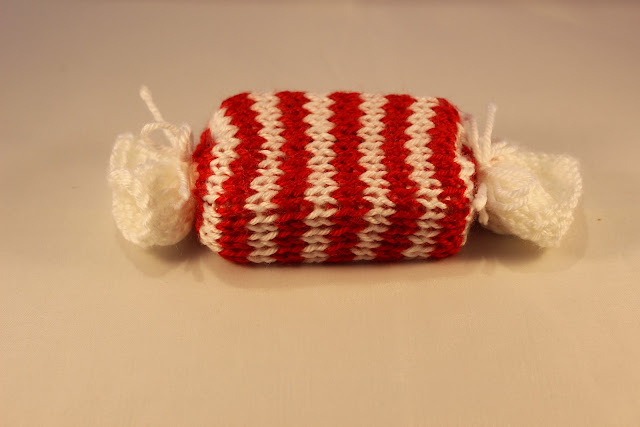 Hence these delightful knitted morsels will line my table this year. 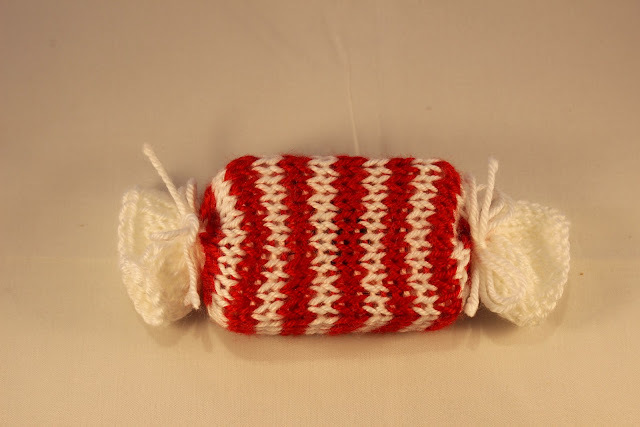 If you fancy making some of these cuties for yourself they are simply 24 stitches on size 10us knitting needles knitted up with red and white worsted weight yarn, in a pattern of 7 rows white, 2 rows red, 2 rows white, until you have 7 red stripes then finished off with another 7 rows of white. Next, cast off, sew in your thread ends and sew up then seam while forming a tube. In addition to the soap I will add the snapper before tying the ends closed with some yarn. Finally, I will add a name tag to each one taking care of the place setting markers as well. Brilliant, a great cracker with no calories. Perhaps paper is one the most versatile products on the market, the choices are endless, even so it seems we all have a favourite type or look. Even though I do love shiny and sparkly it seems when it comes to Christmas decorations and tags I tend to gravitate to the more traditional look. 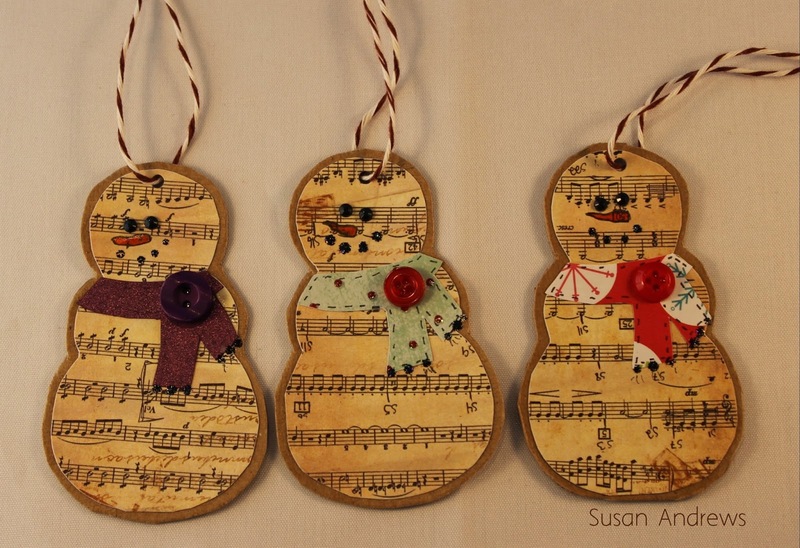 With that being said these adorable snowman fall right into that category sporting there rustic vintage look, papers of music notes and postage prints. 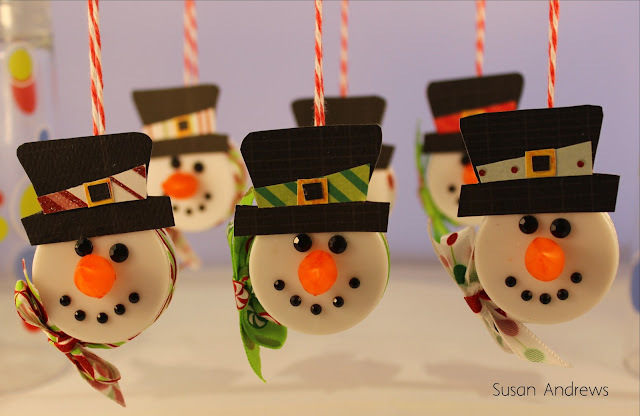 Not only are they super adorable but they are the perfect size to adorn my skinny pole type Christmas tree where smaller and simplistic ornaments are a must. Here is another quick project. 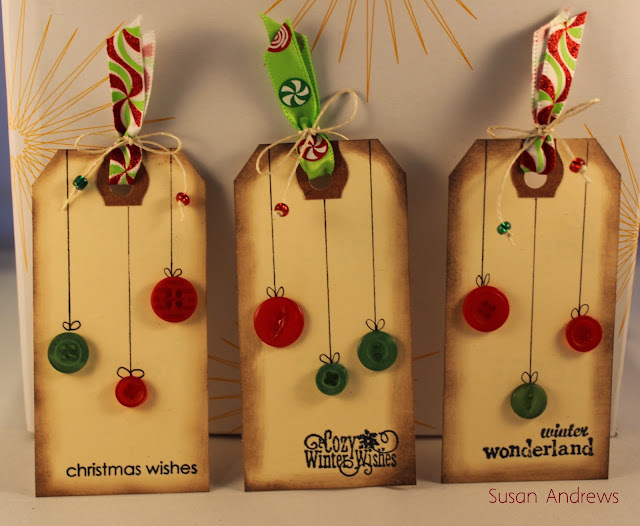 These adorable yet simple tags take no time to make when using precut shipping tags from you local stationary store. 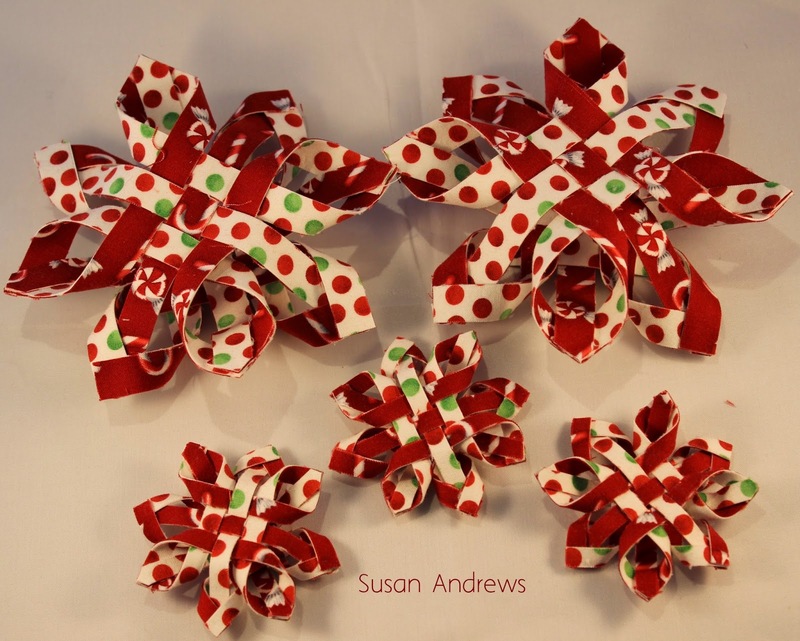 Along with a few buttons, a seasonal sentiment, some straight lines, finally a bit of ribbon, and voila, a cute, fast and easy tag to adorn that special gift. Unfortunately I know all about wind. Living in southern Alberta we certainly get to experience strong winds (sometimes reaching well over 100km), the worst times are usually spring and fall, although this can occur anytime of the year. Mind you wind is a natural resource which southern Alberta is taking into account, the landscape on the prairies is quickly becoming the next Holland with strips of windmills dotting the country side, quite a pretty picture. Along with the wind, winter is long and snowy, living in the mountains we do experience lots of the white stuff. What a combination, hence when I saw this Image from Mo's digital pencil I immediately knew it would have to be part of my collection. However, since I decided yet again to create another mixed media canvas, I took to sketching the image to fit the canvas, hence it is not quite to scale as per the original. Today is yet another cute Christmas tree ornament. As much as I don't like the cold and I am not really keen on shovelling snow somehow the frosty snowman has made it into my heart. Actually there is no better way of building that adorable little man than in the craft room where it is warm and cozy. Today's project is super fast and simple to create, a tea light, bit of card stock, bling, a piece of ribbon, a string to hang it buy plus a strong glue is what you need to complete this bright and cheery Frosty. 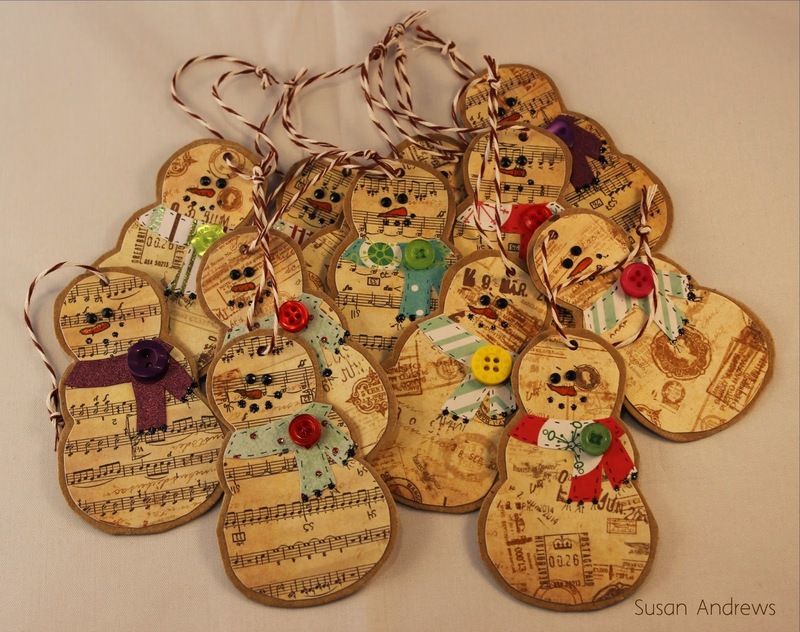 Although, I came across this project a couple of years ago on a card site I follow, many more versions have been seen on Pintrest and Etsy. Well I must say that I am super excited, Thanksgiving (in Canada) and Halloween are both behind us, now it is on to Christmas. Yahoo! 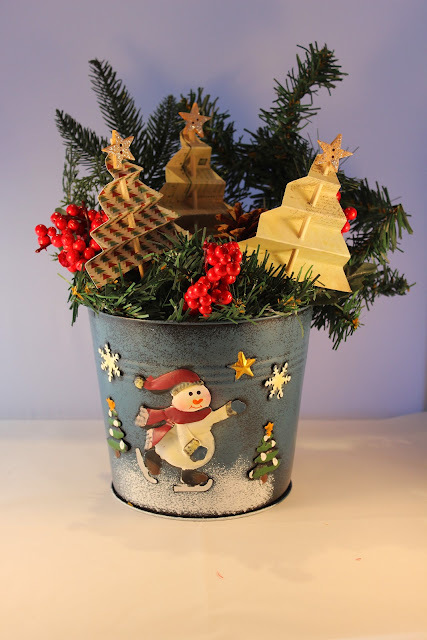 As with most crafters this is the most creative and exciting time of the year, not only is my head swimming with many projects but the limitless ideas on the web are incredible. As a result there is not enough time in the day. To start the season off some simple and quick ornaments are in order. 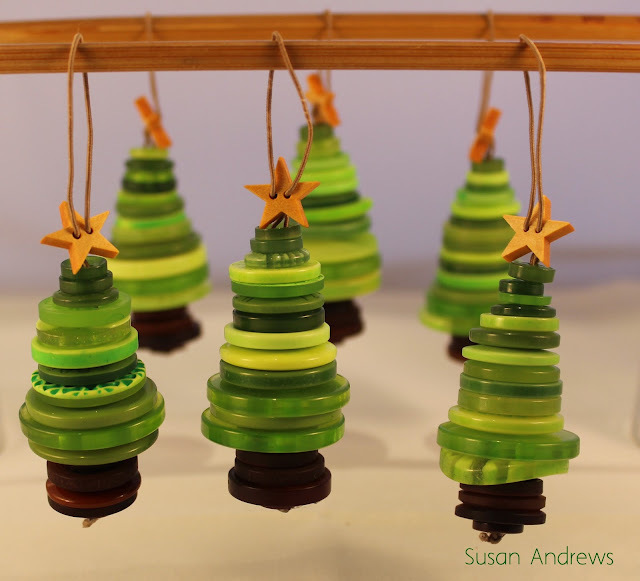 These adorable button Christmas trees are an inspiration from Pintrest the very popular, find what ever you are looking for internet based service. The biggest problem with Pintrest is that there are way too many ideas to get you in trouble. So without further delay on to the trees.